President Donald Trump says he won’t rush into any deal with North Korean leader Kim Jong Un. Trump tells a rally Friday in Springfield, Missouri, that he received a “beautiful letter” two days ago from Kim. But he’s not saying what the letter said. The president and Kim met in June in Singapore to discuss denuclearizing the Korean Peninsula. Trump says he has a “very good” relationship with Kim. He notes that North Korea has returned Americans being held there, as well as remains of American service members who went missing during the Korean War. The president also notes that North Korea has not conducted any ballistic missile or nuclear weapons tests in months. President Donald Trump has taken the stage at a campaign rally in Missouri. It’s his second rally in as many nights. The president is in Missouri to campaign for state attorney general Josh Hawley, who is challenging incumbent Democratic U.S. Sen. Claire McCaskill. Trump has been campaigning aggressively to help the Senate expand its narrow 51-49 majority in the Senate. Trump campaigned in Las Vegas on Thursday night to help Sen. Dean Heller, the only Republican seeking re-election in a state that Democrat Hillary Clinton won in 2016. President Donald Trump has signed legislation to fund the Energy Department, veterans’ programs and the legislative branch, including Congress and the Capitol police. Trump signed the measures Friday during an event at the VA Southern Nevada Healthcare System, where he stressed his efforts to improve veterans’ care. Congress last week approved the $147 billion package as part of an effort by congressional leaders to head off a government shutdown that Trump has threatened he might force over funding for his border wall. The bill includes money for veterans’ health care, military infrastructure, the electrical grid and nuclear weapons programs. It also provides a $1.1 billion increase to pay for efforts to give veterans more freedom to see doctors outside the troubled VA system. And it will require Senate candidates to file electronic campaign finance reports. 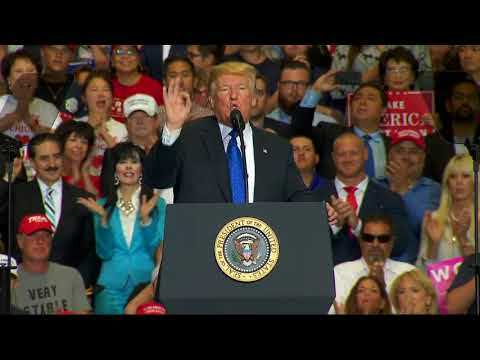 President Donald Trump is in Las Vegas stumping for Republican Sen. Dean Heller, who is in the fight of his career to keep his seat. Heller, who once said he “vehemently” opposed Trump, has now allied himself with the president. Heller is in a tight race with Democratic Rep. Jacky Rosen, a first-term congresswoman who stands to benefit from a wave of anti-Trump activism.